US president discusses peace process, Israeli PM discusses Iranian threat at start of meeting in New York. 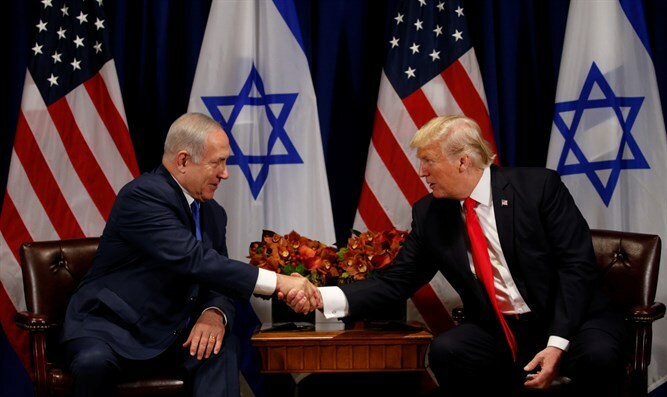 US President Donald Trump and Israeli Prime Minister Binyamin Netanyahu began their meeting at the palace hotel in New York City Monday. “History tells us that this is impossible – in my opinion it is possible,” the president added. Trump did not mention Iran at all in his remarks prior to the meeting until asked by reporters. The Iranian threat is expected to be the main focus of Prime Minister Netanyahu’s concerns during their meeting. “I look forward to discussing with you how we can address together what you rightly call the terrible nuclear deal with Iran and how to roll back Iran’s growing aggression in the region, especially in Syria,” the prime minister added.